Run the MEFF Gateway setup. To accept the license agreement and continue with the installation, select the box next to I accept the terms in the license agreement. If this is the first TT product on your TT Trading System, continue with this step. If you provide an aconfig.xml file, skip to this step. Your MEFF Gateway installs with its own aconfig.xml. For information on how the TT system replicates aconfig.xml across your TT system, refer to the TT Gateway Architecture SAM Version 7.X. 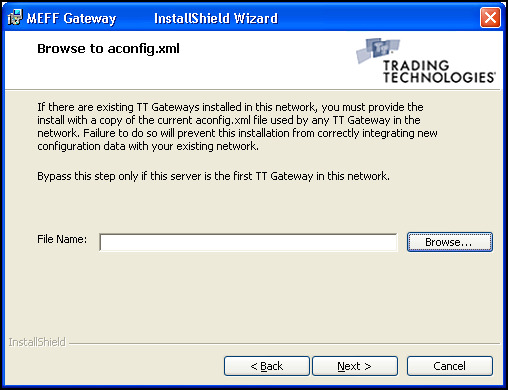 You must supply the aconfig.xml that you use on your TT Trading System so that the install package updates it with new TT Gateway exchange names. 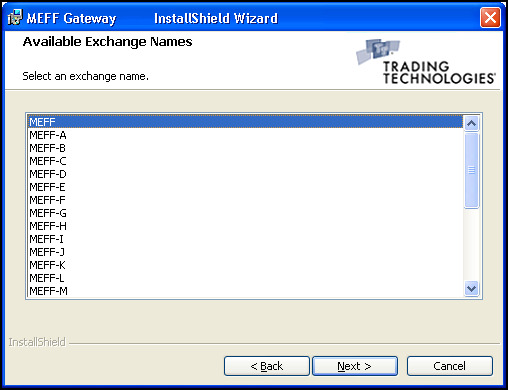 The Available Exchange Names dialog box displays with a list of MEFF exchange-flavors. Click the exchange-flavor that you want your TT Gateway to display in Guardian. To trade on the TT Gateway, traders must log into this TT Gateway exchange-flavor. 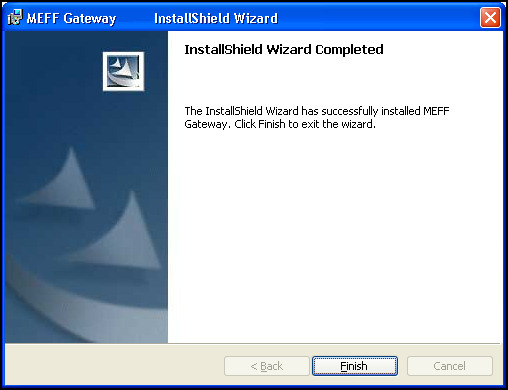 The InstallShield Wizard Completed dialog box appears. To exit the installer and reboot your machine later, click Reboot Later. TT recommends rebooting your machine prior to operating the MEFF Gateway.